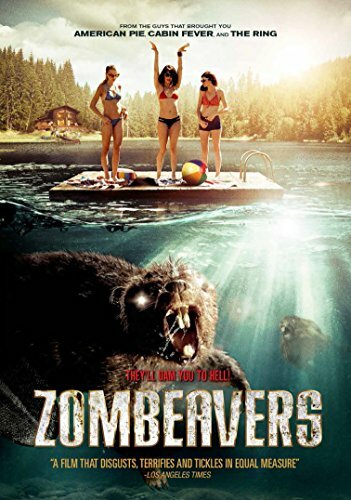 Los Angeles, CA (April 22, 2015) � Freestyle Digital Media has announced its crowd-pleasing horror-comedy Zombeavers is coming to DVD May 19th, 2015, following its day and date release in March of this year. Writer and comedian Jordan Rubin directed Zombeavers from a script he wrote with Jon Kaplan and Al Kaplan. The film stars Rachel Melvin (DUMB AND DUMBER TO), Cortney Palm (SUSHI GIRL), Jake Weary (ALTITUDE), Lexi Atkins (THE BOY NEXT DOOR), Peter Gilroy (THE BEST MAN HOLIDAY), and Hutch Dano ("Zeke and Luther") and was produced by Evan Astrowsky, Chris Lemole, Tim Zajaros, Jake Weiner, JC Spink and Chris Bender. Musician John Mayer and Bill Burr also appear in noteworthy cameos. Recent Freestyle titles include the box office hit GOD'S NOT DEAD, Michael Jai White action flick FALCON RISING, the teen thriller THE SISTERHOOD OF NIGHT, wholesome romance OLD FASHIONED, THREE NIGHT STAND starring Emmanuelle Chriqui, LEFT BEHIND starring Nicolas Cage, and TIGER EYES, the first big screen adaptation of a Judy Blume novel starring Willa Holland. Freestyle Digital Media, LLC was launched in November 2011 by CEO Susan Jackson, Co-President and founder of independent theatrical distributor Freestyle Releasing, LLC and North American sales company Turtles Crossing, LLC, and by Freestyle Releasing co-founder Mark Borde. Freestyle Digital Media supplies quality commercial film and TV content directly to all US VOD/SVOD rental DVD/Kiosks and theaters using the latest cloud-based technologies to automate digital workflow. Freestyle's goal is to provide fresh, well-marketed product and stay on the cutting edge of the ever-compressing windows to ensure that their partners benefit from a platform that delivers an anytime-anywhere capability in the medium of their choice and a positive digital viewing experience on any device in any location.